If you’re interested in solar power, a solar light system for your garden is a great way to get started. A basic solar light system comprises a solar panel to gather power, a battery to store the power, and a lamp or LED arrangement. Manufacturers can fit all those into one neat, self-contained package. 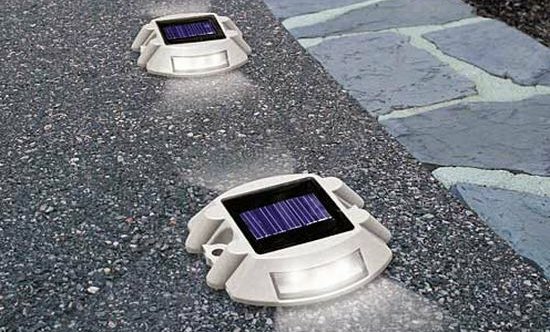 Classic applications include the familiar solar walkway light, which charges up in the day and then ‘gives back’ the light during the hours of darkness. You can buy literally hundreds of different models on eBay, everything from utilitarian stainless steel spikes to gnomes with light-up pointy hats. Solar walkway lights are replacing candles and kerosene lamps in the developing world, and they’re increasingly common in our cities. They have the advantages of low cost (often just a few dollars) and easy installation. The disadvantage is less obvious — it’s to do with power management. Walkway lights usually carry just a few square inches of cells. 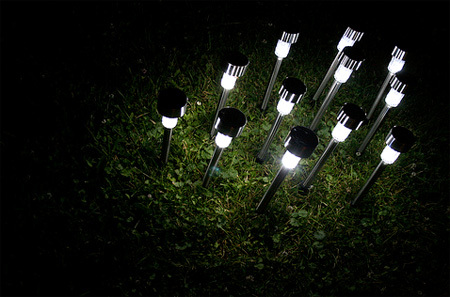 These will tend to be low-cost/low-efficiency, because the light isn’t expected to last — and a line of high-cost spikelights would be a magnet for thieves. So the basic model is designed to provide a gentle, long-lasting glow and to be easily replaceable. Want continuous bright light for a trade sign or outdoor seating area? Crank that budget up by a factor of five… or ten. You’ll need one or more LED floodlights, weatherproof storage batteries, and much larger solar panels. Since all of these items are high-ticket, you’ll also need to budget for proper mounts — for instance, SolarSetPoint.com (who make excellent yard lighting systems) recommend installing their panels on top of a pole to keep them out of harm’s way. Don’t forget the high cost of durable, weatherproof cabling, either!